Private Parties for ages 21 and up and Family Room events! 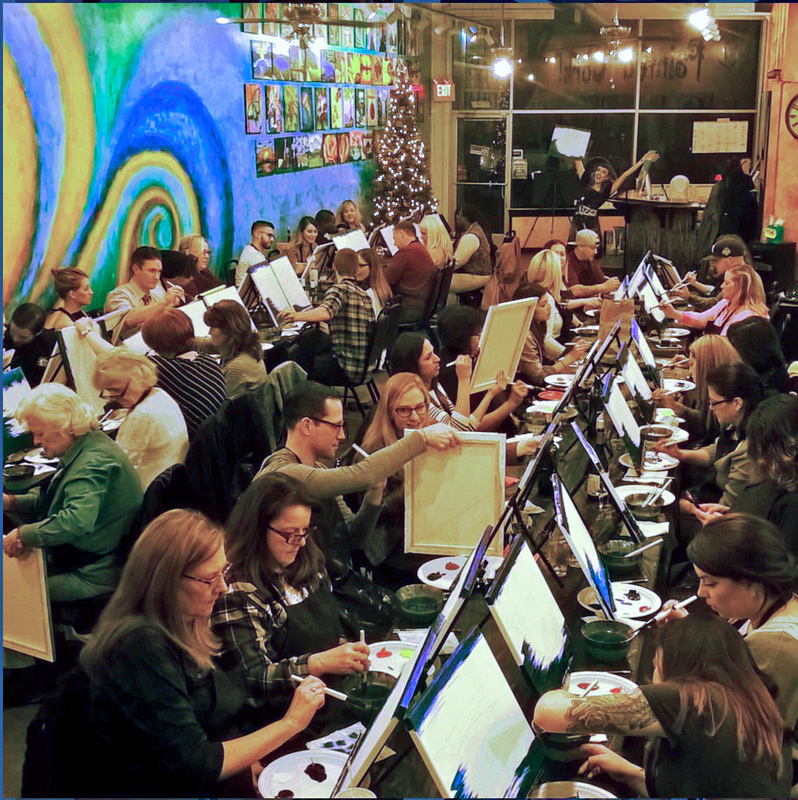 You can book your own private paint and sip event at The Painted Cork and have the whole place to yourself for your birthday party, bachelorette party, bridal shower, baby shower, networking party, corporate event or whatever else you can imagine! Don’t forget that we are a BYOB art studio! Let your imagination run wild when it comes to bringing in your own wine, beer, beverages and food! Some guests just bring wine and cake, some do potluck style and some have their events full blown catered! We supply complimentary paper plates, cups, napkins, plastic cutlery, plastic wine glasses, bottle openers, designated food tables and a full refrigerator for your use. Feel free to bring in your own glassware, plates or anything else necessary to make your sipping and nibbling experience wonderful! The picture to the above left shows our beautiful and massive 21 and up studio in Folsom at 726 Sutter St in "Old Town" Folsom! We can hold up to 70 guests! Our SACRAMENTO studio is strictly 21 and up due the licensing necessary to allow beer and wine into our studio per California state law. However, our FOLSOM studio and our SANTA CRUZ studio each have 2 separate studios in one location! We have a 21 and up studio (Folsom adullt studio shown above) and we also have a separate "Family Room" studio which is alcohol free and all ages are welcome! Scroll down below for more information about booking events in our Folsom and Santa Cruz Family Room studios. Fill out the form below with as many details as you can regarding your request or give us a call and we will fill one out for you! Guests may reserve a private party on weekdays M-Th and Friday day with a 13 painter minimum or on Friday night, Saturday or Sunday with an 18 painter minimum. Our prices run as follows, $35 per person for a 2-hour class, $45 per person for a 3-hour class and $50 per person for a 4-hour class. Class hourly times (2,3 and 4 hours) are based on the painting selection. The initial invoice is usually sent for the 2-hour rate until the painting choice is made. Any additional time needed for the party will be an extra $75 an hour or $40 for a half hour. The 13 or 18 minimum guest deposit must be paid for as soon as possible in order to reserve your date and time slot for the party and we allow 7 days to pay the invoice. Additional guests may be paid for on the day of the big event. Non-painters are still considered as “paying guests” and will be charged the class fee for attending the party and using our facilities. We can accommodate a whopping 70 guest maximum at our Historic Folsom location and 50 guest maximum at our Midtown Sacramento location! See the picture of our gorgeous SACRAMENTO studio in the picture to the right, all set up for a Christmas party! A private party includes your choice of one painting (click the Gallery tab located above for painting selections), 2-4 hours of professional art instruction (time is based on painting choice), all materials (aprons, easels, canvases and ALL art supplies), all plastic plate ware, eating utensils, cups, plastic stemware and napkins. All painting setup and clean up for the painting experience are provided by The Painted Cork! Oh, did we mention that you are also more than welcome to bring wine, beer, non-alcoholic beverages and food to enjoy throughout your party?! All of our competitors charge their guests for in house drinks so our BYOB option will save you a TON of money! And the food options are wide open. Some schedule a potluck with their group, some order take out from the amazing restaurants in our surrounding areas (we have a list if needed! 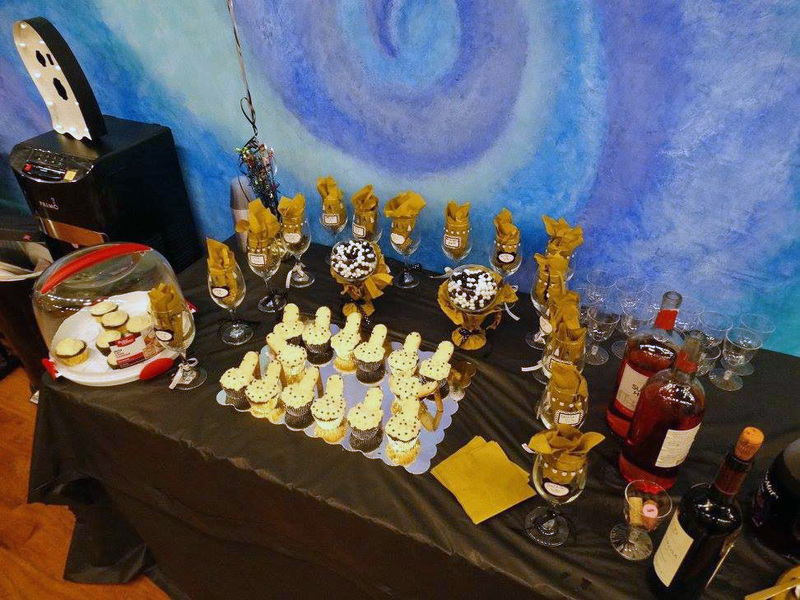 ), some just bring cake and wine, and some go ALL OUT and plan for full catering! You can really customize your event to your own needs. We strive to make our guests happy and comfortable in any way we can. If you have any special requests before or after the private party, feel free to call us to chat about it! What can I do if I don't have enough people for a private event? How about picking the details for a public class? 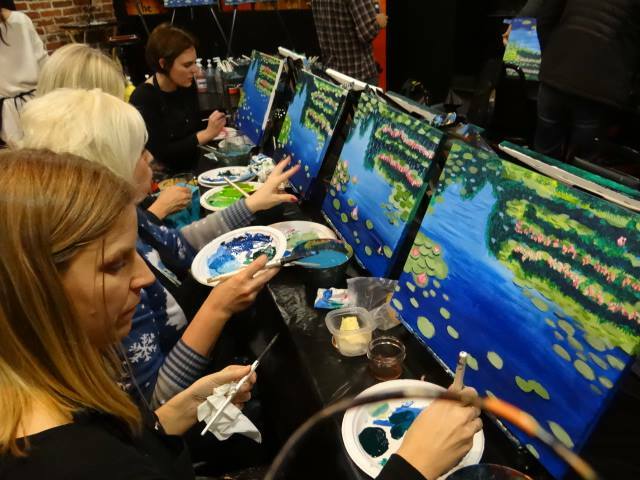 Let us know your painting choice, studio location, time and preferred date and if it works with our calendar, we will post your class to our calendar and send your group a direct link to the class information and online registration where your group can sign up individually online for the event. This route eliminates the need for the invoice payment and the minimum amount of guests. The event would be a public event, however we will make sure that your group sits together and you can still bring in any beer, wine, beverages and food to enjoy throughout the class! We do offer KIDS PAINTING PARTIES and FAMILY PARTIES in our Folsom Family Room studio at our FOLSOM studio at 726 SUTTER ST in Old Town Folsom and at our SANTA CRUZ studio at 1129 Soquel Ave! We ONLY require 10 painters minimum to reserve your Family Room party! A 2 hour is only $35 per person for the first 10 and ONLY $20 for any additional guests! We can hold up to 35 guests in our FOLSOM Family Room and up to 15 in our SANTA CRUZ Family Room. Bring your presents, cake, non-alcoholic beverages and food to enjoy throughout the party! Pick your favorite painting from our Gallery or have us create one for you. Fill out the form below to begin the process of booking your event or call us for details ~ FOLSOM studio (916) 985-4535 or SANTA CRUZ studio (831) 471-8939. Prices subject to change due to availability or last minute scheduling. Do you love the Painted Cork concept, but would prefer to have a paint and sip party at your home, restaurant, winery or special event? The Painted Cork will come to you! Depending on the painting that the host chooses, the painting times range from 2 to 3 hours at a rate of $40 to $50 per person with a 20 painter minimum and a $150 travel and setup/clean up fee. This includes all travel up to 30 miles from the Folsom Painted Cork studio, set up for the class, all art supplies such as easels, brushes, paints, aprons, table coverings, canvases, 2-3 hours of professional art instruction and all clean up. Please note that our professional instructor must be allowed at least 1.5-2 hours to arrive early and set up and there must be tables and chairs already present at the place of painting. A sink is also needed for water bowls and minor clean up. The Painted Cork would like to give back to the Folsom and Sacramento Community! We do require a 20-painter minimum to be paid up front in order to secure a non-profit fundraiser date and time. All fundraisers classes come with 2 or 3 hour paintings at $45 – $55 per person with $10 going back to the fundraisers featured organization. We will advertise your fundraiser on our Facebook page and newsletter, but it ultimately is up to the host or organization to get the guests into the fundraiser event through advertising their own event and directing their participants to sign up either through a private or public fundraiser which will be posted to our class calendar. Fundraisers can hold raffles, silent auctions, bring in a winery to do tastings or even have a restaurant donate some delicious appetizers etc! Food, wine and beer are welcome at our studio so the doors are wide open for ideas!